LED tubes, LED fluorescent tube replacement. Fluorescent tubes are used millions of times in the commercial sector. The standard lengths of 60cm in louvered luminaires and 120cm and 150cm in length are usually used. In conjunction with fluorescent tubes, a starter or ballast is always used. 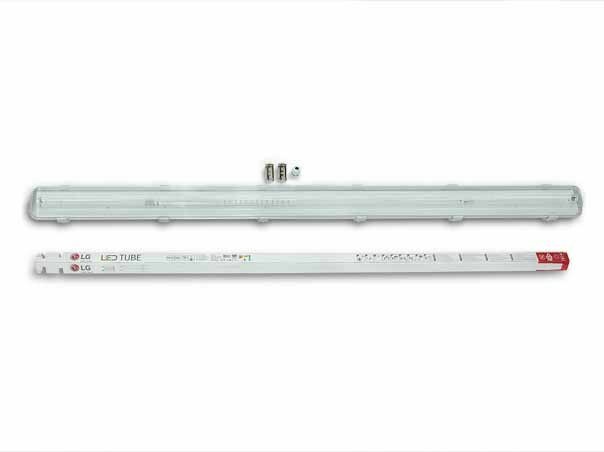 Conventional ballasts in the variants CCG (simple starter) or low-loss ballast (LLB) are very well suited for conversion to LED (fluorescent) tubes. There are 4 common T8 (LED) tube sizes. The most common lengths used in offices are 60cm in grid ceilings / coffered ceilings and 120cm and 150cm in commercial, industrial or storage rooms. 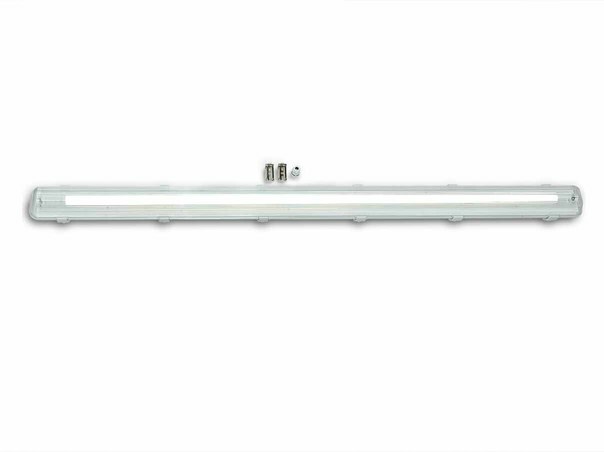 The 90cm T8-LED tube is less common and is mostly used in furniture or showcases. If existing luminaires are to be replaced, they must be remeasured before purchase. The T8 tubes have a diameter of 26mm. The base / the socket is called G13. This is the criterion for many customers. Single LEDs have long lifetimes between 30,000 and 50,000 hours. 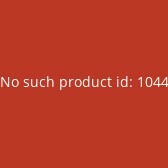 This is also usually stated in the product information. The LED tubes also contain electronic components (such as capacitors and triacs). The quality of these components and their processing - for example at the solder joints - have an important influence on the actually expected service life. Normally this has to be calculated exactly in each individual case. For example, we would not offer a 150cm LED tube with a luminous flux of 2500 lumens. With a wider beam angle, a little more. Investment: Can you really save money with a 30 Euro LED tube lamp compared to a 3 Euro tube? Yes, especially in companies or businesses with long operating and opening hours. It doesn't matter whether it is a company with 2 or 500 employees. For the efficiency of T8 LED tubes, the daily operating times (operating times or opening times in retail), the considerably longer service life of the LED tubes but also the lower maintenance costs are decisive criteria. Power saving LED tube: 50% and more are in it. The classic fluorescent tube is always operated in conjunction with a ballast (low-loss ballast, electronic ballast, conventional ballast). This consumes additional power, which can be up to 15 watts per bulb. When simply replacing the fluorescent lamp with LLB with an LED tube, the ballast unit continues to be operated. It may be more economical to replace the complete luminaire in order to supply the LEDs directly with 230V. An individual calculation is necessary. We no longer sell LED tubes made of glass. The reason for this is the higher risk of breakage in use, a faster loss of luminous flux and less durability in continuous use. The light colour is indicated in Kelvin (K). In the commercial sector or office, a neutral white between 4500-5000 Kelvin is usually used. This is perceived as stimulating and less tiring during work. In living rooms or to achieve ambient effects, a warm white light colour (2700-3300 Kelvin) is usually chosen, which has a cosy effect. In manufacturing, workshops or industry, where precise vision, good contrasts and very bright illumination are often required to ensure faultless work, a light colour from 5500 Kelvin to 6500 Kelvin, known as cold white or daylight white, is often used. This is also considered less tiring and stimulating. In addition, daylight white has a better reproduction of contrasts, which is an additional safety factor at work. Batten fittings LED ready. We offer LED ready batten fittings in the standard sizes 600mm, 1200mm and 1500mm. The T8 batten fittings will be operated without ballast. Therefore no additional electricity is consumed. Industrial emitters & bay light HQL industry emitters and indoor radiators will increasingly be replaced in the coming years. By 2015 the production of HQL lights will be banned in Europe. Many thousands high-pressure mercury lamps (HQL) have to be removed and replaced. On the market you will get different technologies and alternatives allowing for a winning promising conversion or replacement of bay light. The main argument for a new generation of hall lamps is energy efficiency and the requirement for a lower energy consumption. Reduced electricity costs in hall spotlights: Energy costs can be decreased by the exchange or conversion on induction lighting or LED bay light sby about 40-60%. It always depends on the local conditions. Using modern technologies can achieve the same or better light quality at a 50% lower power consumption. Often combined with contrast-enhanced light output. In industrial buildings with a height 8-16 meters, the maintenance factor is an economic aspect, which is often not considered. Classic high-pressure mercury lamps (HQL) with a lifespan between 5000-7000 hours quickly lose their luminosity and must be replaced frequently. Lighting design installations have often been oversized the past so, this resulted in higher electricity costs. When selecting new technologies lights with long life, high efficiency and a high lumen maintenance factor are recommended. This guarantees a constant quality of the emitted luminous flux of the lamp over a longer period. Longer maintenance cycles for plants at high altitudes be financially directly noticeable. The subject of LEDs is currently on everyone's lips. However, using LED in indoor spotlights glare is an important issue. The high level light output of an LED emitter from a moderately small area- LED modules produce a short blinding effect to the human eye. This can lead to glare and short failures of the visual performance. The problem is especially when working with a forklift in high racks, rides to the load or crane with a brief look at the ceiling. This can result in dangerous situations. Possible alternatives are induction lamps which radiate over a larger area, thereby producing substantially less glare. As a replacement for high-pressure mercury lamps (HQL) alternative conversion kits that allow to obtain the lamp and replace only the bulb and the electronic ballast are available as cost-effective solution. A conversion can be achieved quickly for an experienced technician. Our induction conversion kits which can be incorporated into existing HQL lamps offer an affordable solution. Induction lighting is extremely reliable and easy to maintain, has a high light output and produces a pleasant light to the human eye. Not without reason is set on high bridges and runways of airports on induction lighting. Industrial radiator and bay light are used in the manufacturing industry, warehouses and high-bay warehouses, sports halls, assembly rooms. For more information on how you can further increase your energy efficiency and can achieve through the use of efficient lighting systems a better light at lower costs call us without obligation, or send us an inquiry through our contact form. LED panels offer a number of advantages and design possibilities for commercial use. One advantage of the LED panels is the very good energy efficiency ratios due to their low power consumption. They produce a beautiful, uniform light that creates less glare due to the area-based radiation. This makes the inlay luminaire also very suitable for use at computer workstations. Our LED panels are available in 30x30cm, 62x62cm, 60x60cm, LED panel 120x30, LED 120x60 and round LED panel. We also offer special variants, such as glare-free versions for computer workstations, LED panels with CRI>90, IP65 LED panels or complete ceiling mounting with mounting frame. LED tracklights: We offer a range of energy-efficient LED spotlights for 3-phase track lighting from 10W with 600 lumens to over 4000 lumen luminous flux. 3-phase track LED spotlights are often used as LED spotlights in retail stores and for accent lighting of products and goods. Our customers are mainly small to large retail stores, pharmacies, bookstores, galleries and large museums. A large number of LED rail spotlights are also used on trade fair stands. In the meantime, customers mostly choose models with very good colour rendering and colour fidelity. The light quality and product illumination of our CRI92 models has convinced customers in many tests. The heat generation is also significantly lower with LED 3-phase rail spotlights and is therefore an ideal replacement for the very hot CMT spotlights, for example. The very low proportion of UV light also protects goods from fading. LED spotlights for 3-phase track lights are very flexible in mounting and use. Recessed LED luminaires are energy-efficient and can be quickly and space-savingly integrated into existing ceiling cut-outs. The advantage of LED downlights is that they hardly protrude out of the opening and thus do not interfere with the overall picture. Our LED downlights are available in different light colours and for different installation dimensions. In offices and at bioscreen workstations, particularly strict requirements are placed on brightness and low glare. The glare value must not exceed UGR<19. We have several reflector downlights that are ideal for these requirements. We also have some LED recessed spotlights with IP44 protection rating for use in roofed canopies. We have a wide range of recessed LED luminaires for almost every available hole size. It doesn't matter whether it is a flat construction, dimmable or with special power supplies. We can meet almost any requirement. The installation of our LED recessed luminaires is quite easy due to the existing quick-release clamps. The downlights have optimised heat management, which has a positive effect on the service life of the LEDs. The LED drivers are space-savingly integrated in the housing. Depending on the industry and the work task appropriately high requirements are placed on the lighting system It is the object to realize a high energy efficiency lighting system with an optimum lighting quality. LED industrial lights help to meet these requirements perfectly. The challenge for the industrial lighting system is to is minimize impact of external influences such as dust, shavings, temperature fluctuations, permanently high humidity or chemical vapors. For the most common bulbs there are now very good and affordable LED bulbs that achieve a good light color and a long lifetime. The power savings after the replacement vary between 50-60% with a comparable light intensity. Replacing classic bulbs with LED bulbs is often described by the term ?LED Retrofit?. The conversion of existing bulbs by LED retrofit is a fairly quick and simple way to achieve energy savings. The standard sockets and bulbs as the standard bulb socket as E27 LED, E14 Leds (candles), GU5.3, GU10, as well as in the commercial sector widespread T8 fluorescent tube (neon) and E40 lamps are available as LED retrofit lamps. We have created a short summary with tips, how to select the proper LED bulb for your needs. 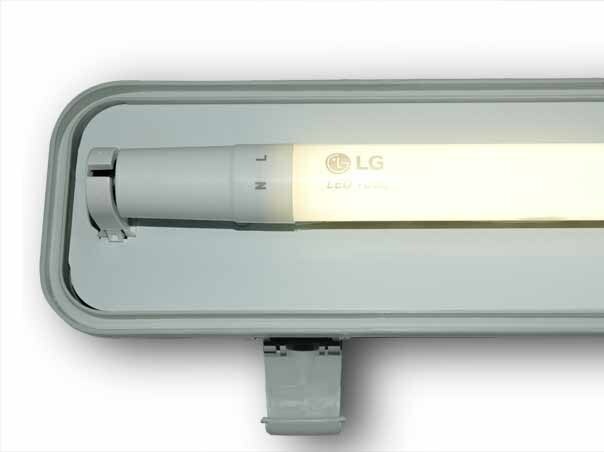 Affordable 150cm LED tube from LG Electronics with VDE certification. We are closed over Easter from 12.04.2019 to 22.04.2019. In urgent cases please write a short e-mail or call our office number. We will get back to you as well.